I’m finally getting around to posting my recap of our trip to Disneyland and the Disneyland Half marathon, which was the second half of completing the Coast to Coast Challenge. 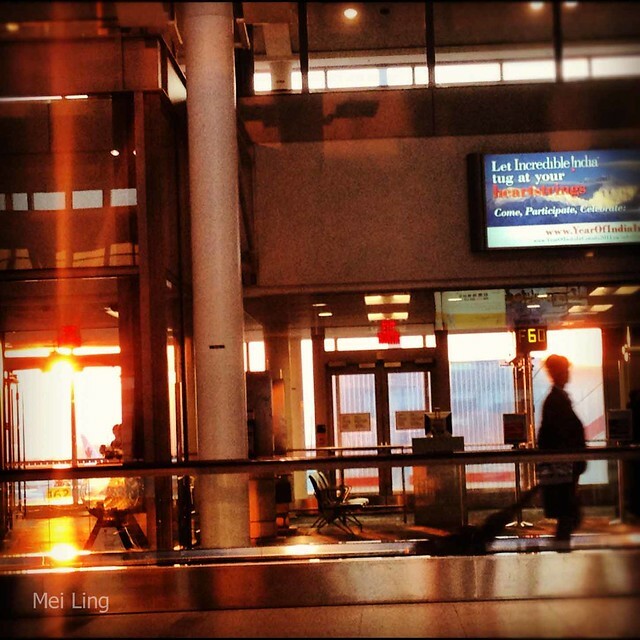 I took this picture at the airport in Toronto. It was an early morning flight so we watched the sun rise. 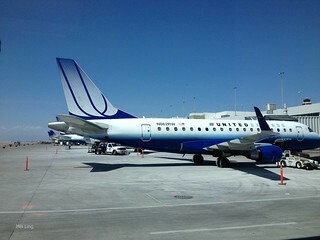 Our flight took us from Toronto to Denver and then Denver to Santa Ana. 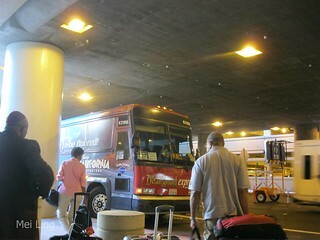 From Santa Ana we would take a shuttle bus to our hotel in Anaheim. The first leg of our journey was pretty painless and we made it to Denver Airport. The Denver International Airport always reminds me of this hilarious segment that Stephen Colbert did on it. 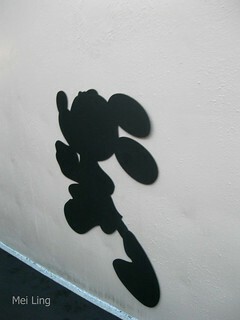 His segment covered conspiracies about the airport (including all of its phallic symbols). I couldn’t find the video online but here’s a clip of Anderson Cooper talking about it on his Ridiculist. In case anyone is wondering, we didn’t see any phallic symbols at the airport. But maybe we were in the wrong terminal for that. When we landed I was starving. We were looking at a map for food when a man in a cowboy hat offered to help us. Dan asked him about places to eat and he outlined all of the places near us. “Great!” I thought, “We’ll eat at one of those places!” But then Dan asked him about a few other places that were further away and the man told us about the fresh baked bread at one of them that was about a mile walk away from us. Then Dan started asking about other places to eat that weren’t near us and I finally lost my mind and said “I’m hungry! Let’s just eat here!” Later Dan said that if I had complained about the mile walk he would have made fun of me since we were on our way to run a half marathon. After eating (and when I felt human again) we also had ice cream at Ben and Jerry’s. I love these Ben and Jerry’s cut outs so naturally we had to pose. 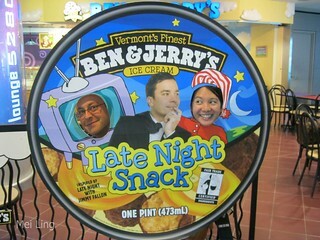 This one featured Jimmy Fallon, which also reminded me of his feud with Colbert over their competing Ben and Jerry’s flavours. 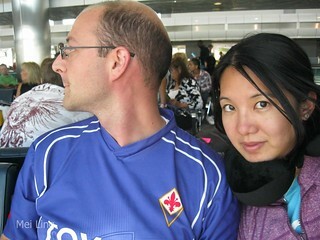 Then we had to wait for a long time because our flight was delayed because they couldn’t find our plane! We were super impressed that they couldn’t find our plane and waited patiently for a few hours. None of these planes were ours. They finally sorted things out and found us a plane. They announced that it was a little bit smaller than our original plane but none of us cared as long as there was room for all of the passengers. 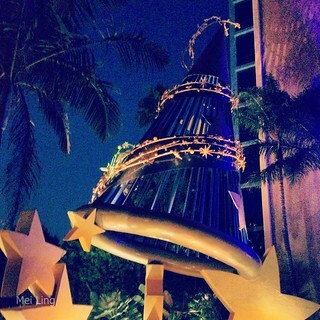 We took the Disney Express shuttle from Orange County to Anaheim. Our bus driver was hilarious but also really helpful. 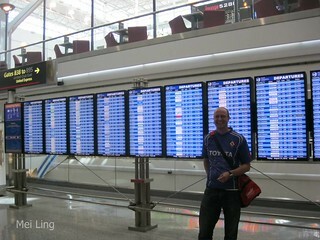 He told us what times we should take the shuttle based on when our departing flights were. We were staying at the Fairfield Inn Marriott so he told us how to take the shuttle (there wasn’t a direct one from our hotel). Then he told us if we wanted we could walk up the street to another hotel and take a direct shuttle from there. So we got the times and where to go for the shuttle from him. It was great. He also warned us about fake “Disney Express” shuttles. They’re buses with the same name and they try to get you to pay for your ticket again. They tell you that even though you already paid you need to pay again and to turn in a voucher to get a refund. 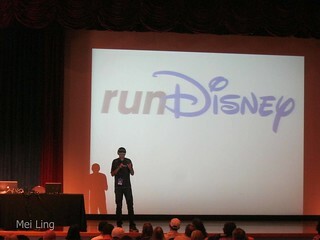 He gave us tips on how we could tell if it was an authentic Disney Express shuttle and told us to never ever pay again. If we’re told to pay again it’s a fake. We checked in at the Fairfield Inn Marriott. 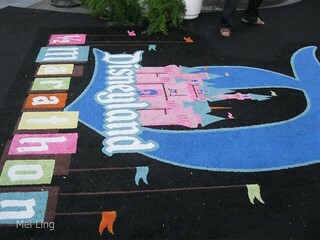 It was really convenient since it’s across the street from Disneyland. We later learned that you can see some of the fireworks from the hotel. 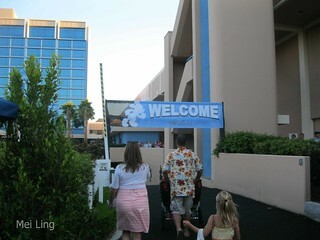 After checking in we ran across the street to the Downtown Disney area so we could get to the Disneyland Hotel for the Race Expo and Race Kit Pickup. Because of our delayed flight, we cut it really close and go to the expo at 7 (it ended at 8). If we had missed it it wouldn’t have been the end of the world since they have expo hours the next day too, but I didn’t want it to cut into our time in the parks. Run Disney merchandise always sells out quickly and I wanted to see what they had. 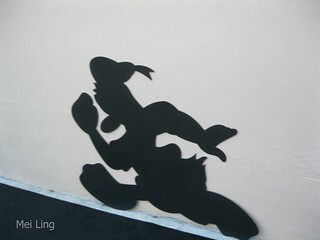 I always love all of the little details that Disney puts into their races. Made it just in time for packet pick up. We made it to the expo! 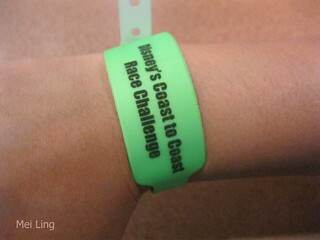 As participants of the Coast to Coast Race Challenge we were given these bracelets to wear. When you finish the Disneyland half they cut the bracelet off and give you your Coast to Coast medal too. 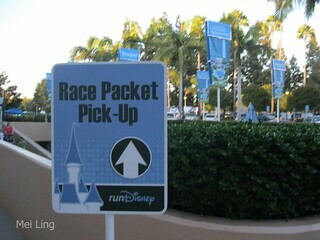 We picked up our race kits and bought our park tickets (there’s a discount if you’re participating in the race). Then we headed into the expo. 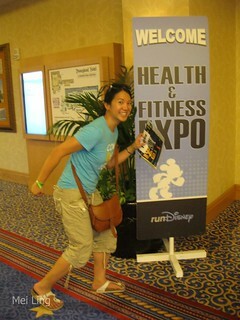 It wasn’t as big as the expo in Disney World but it still had a lot of exhibitors. Jeff Galloway spoke at the expo. I used his training plans for my first two half marathons. 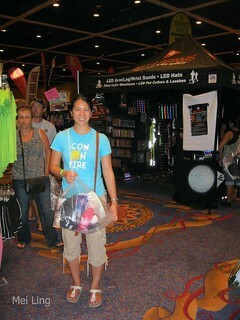 Me with all of my goodies at the Race Expo. They also had a little staging area where you could get your picture taken with your race bib. It was a nice touch. 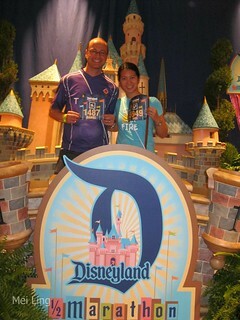 Dan and I with our Race Bibs in the Disneyland Half Marathon staging area (complete with castle and logo!). They had volunteers take the pictures on your own camera. It was a nice touch. 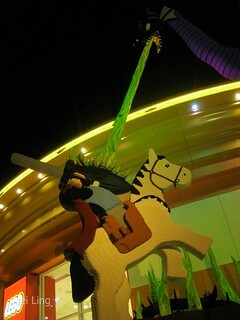 After the expo we explored Downtown Disney and admired all of the lego Disney characters. 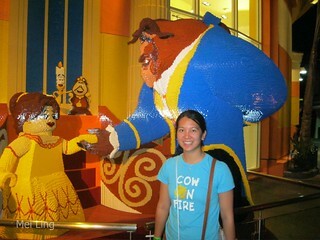 Hanging out with Belle and the Beast in Lego form. You can see how big they are! 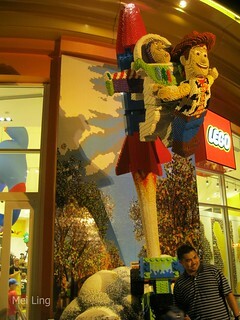 Lego Buzz Lightyear and Woody. I love Buzz Lightyear. Lego Prince fights Lego Maleficent the Dragon from Sleeping Beauty. We went to the World of Disney and bought some souvenirs. 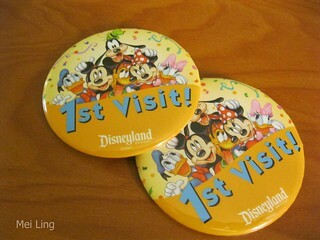 When the cashier heard that it was our first time in Disneyland he gave us some buttons. Overall, despite the flight delay it was a pretty successful first day.